3 Postum Party Cocktails (Even a Virgin One)! Today's post is going to be some cocktail ideas for any upcoming cookouts or parties you plan on hosting. Two of the three recipes are alcoholic, however one is non-alcoholic, so I think you'll have something for everyone serving these drinks the next time you entertain guests. 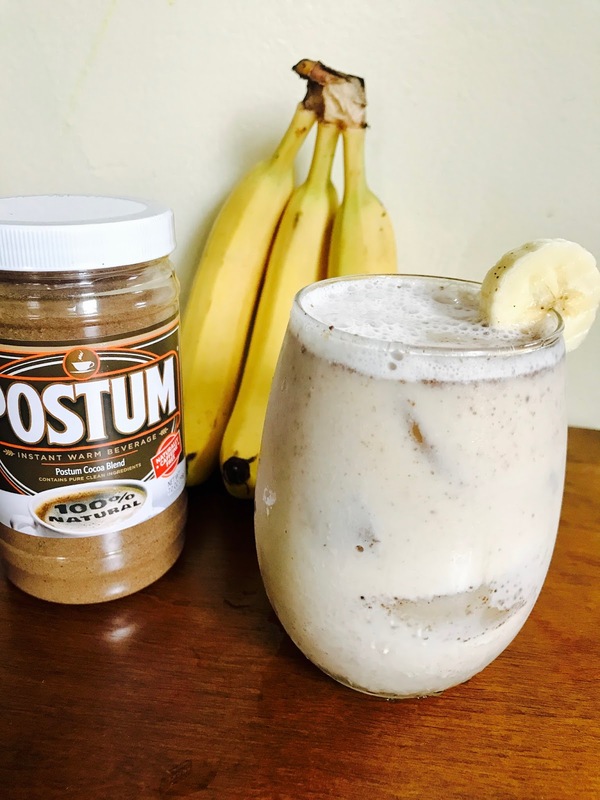 In these recipes I use all three Postum flavors: Natural Coffee Flavor, Postum Cocoa Blend, and the original Postum flavor. Feel free to substitute one for the other to suit your preference. Postum is the perfect product to swap around flavors in recipes because doing so won't ruin the recipe whatsoever. The flavors will change slightly but in such an enjoyable way, that is really what I love about using this products in my recipes: the versatility of the product as well as how tasty it is in everything that I have made so far! Let's get to these boozy recipe! The next cookout holiday that we have here in America, will be Independence Day next month, so if you are having a party and want to serve something different and fun, you should give these cocktail recipes a try! Prepare Postum by mixing it with boiling water and set aside for a few moments to cool. In a cocktail shaker, place ice, prepared Postum and give it a shake. Serve by pouring into martini glasses (without ice using the strainer lid), and enjoy! There is this drink called a Tootsie Roll, that is made with coffee flavored liqueur and orange juice. It is a really tasty drink and almost does taste like a candy lolly pop. I thought that this would be the absolute best drink to make non-alcoholic, and I was right! So tasty and fun. You wouldn't have thought to mix Postum with orange juice, now would you? Prepare Postum by mixing it with boiling water and set aside for a few moments to cool. In a cocktail shaker, place ice, prepared Postum, orange juice and give it a shake. Serve in glass of choice (fun with a paper umbrella for garnish) and enjoy! Prepare Postum by mixing it with boiling water and set aside for a few moments to cool. Fill a tall glass with ice. 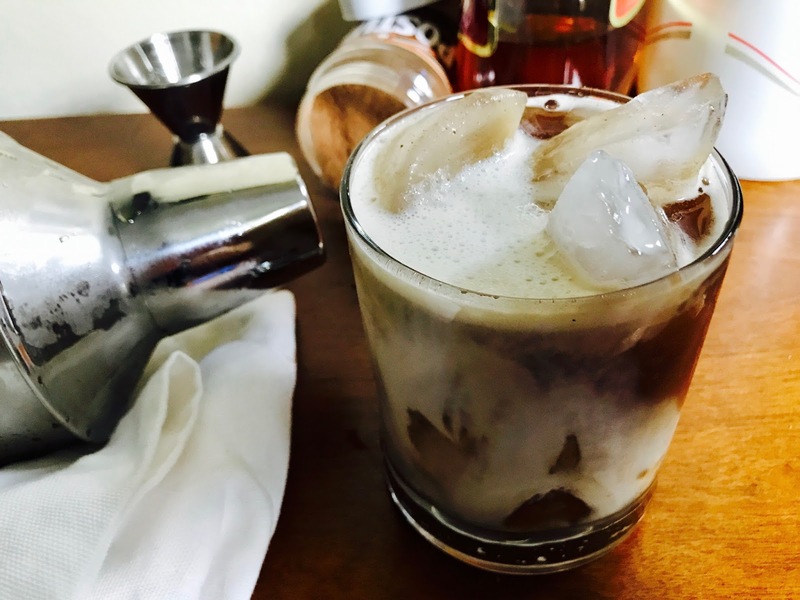 In a cocktail shaker, place more ice, prepared Postum, banana liqueur and give it a shake. Pour contents of shaker strained into glass, then add coffee creamer and top with pineapple juice. You can garnish with cherries or whipped topping or just enjoy it the way it is! I hope you get a chance to try these recipes. They came out awesome! And big thanks to the folks at Postum for sponsoring this recipe post and for generously supplying the product. 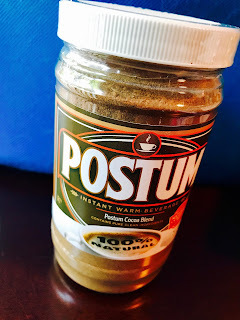 Stay tuned for a Postum giveaway coming soon where I'll be giving away a jar of each fabulous flavor! Vegan Rice Back At Taco Bell! I just wanted to let everyone know that the vegan rice at Taco Bell is back again! There was this weird thing that happened with their rice recently. They came out with vegan rice and launched their vegan menu, then suddenly started adding dairy to their rice in the form of butter, and it was no longer an animal-product-free rice. But now their vegan rice is back and the old butter rice is off the menu completely. This vegan rice is currently the only rice on the menu so that there will be no confusion as to which rice is safe for vegans to eat. Pheeeewwwww! 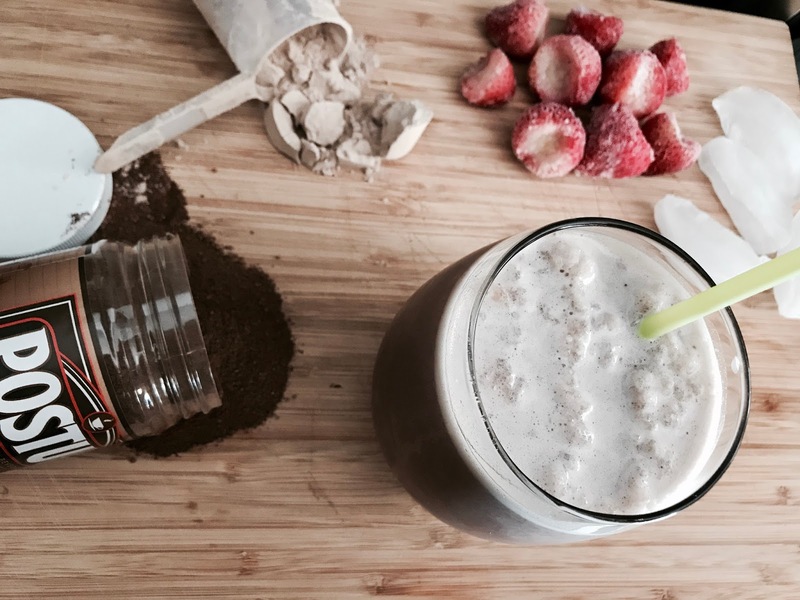 3 FABULOUS Protein Shake & Smoothie Recipes for Our Fit Fam! 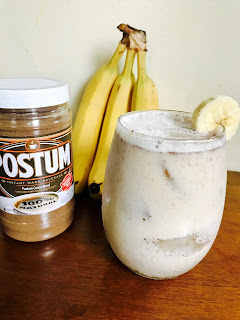 I've done fabulous Postum recipes for cocktails, desserts and dessert-like beverages, even savory recipes too, but it occurred to me that all of those recipes were very rich and some even included ice cream or alcohol - what about recipes using Postum for the health conscious? And let's face it, we are ALL health conscious every now and again, especially when we are trying to cut back a little or get in shape before a big event. So I wanted to do some smoothies and protein shake type of recipes that would be great to enjoy before or after workouts, as meal replacements, or as healthy snacks for when you are trying to eat a bit more on the clean side - but of course, in true Dirty Vegan style, they are fun and delicious too! All recipes make 1 large shake or 2 small ones. Prepare Postum by mixing it with boiling water; set aside and allow to cool a bit. In a blender add prepared Postum and the remaining ingredients; blend until smooth. Enjoy! These drinks totally taste like desserts in a cup, without adding any additional sugar, other than what is already in the fruit or the vegan milks. If you want to cut down on the sugar even further, you can always opt for protein powders sweetened with stevia or other sugar-free sweeteners instead. 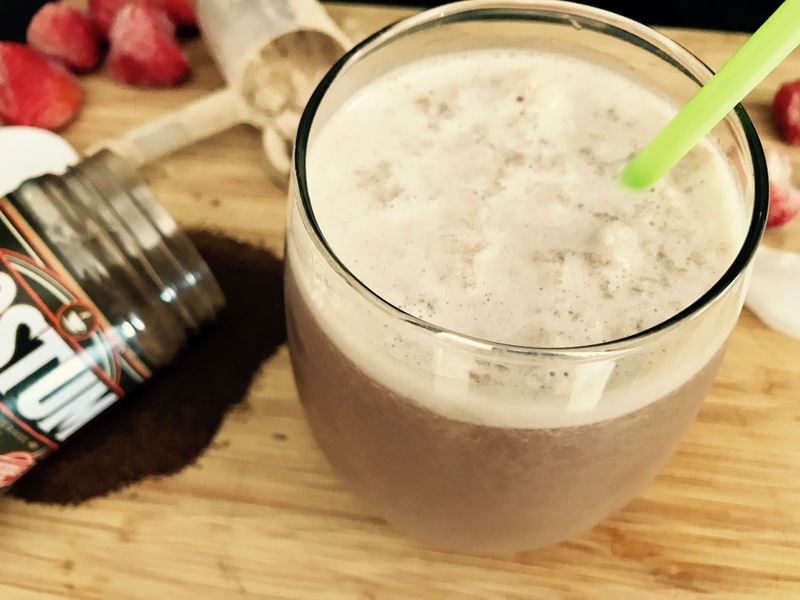 These pre- or post workout beverages are so easy to make and customize. Try using different fruits or nuts and even nut butters to create your own! Be sure to share pictures of your creations with us on social media! You can find Me on Twitter, Instagram and Facebook AND you can also find Postum on Twitter, Instagram and Facebook as well. And for now, the Dirty Vegan is signing off, smiles from my kitchen to yours! Neopolitan Fountain Float & Almond Joyful Postum Cocktail Recipes! 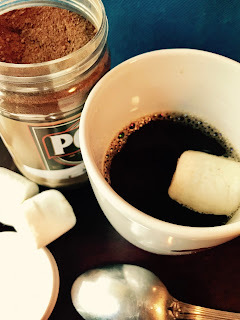 This is the second part of yesterday's post where I introduced Postum Cocoa Blend. 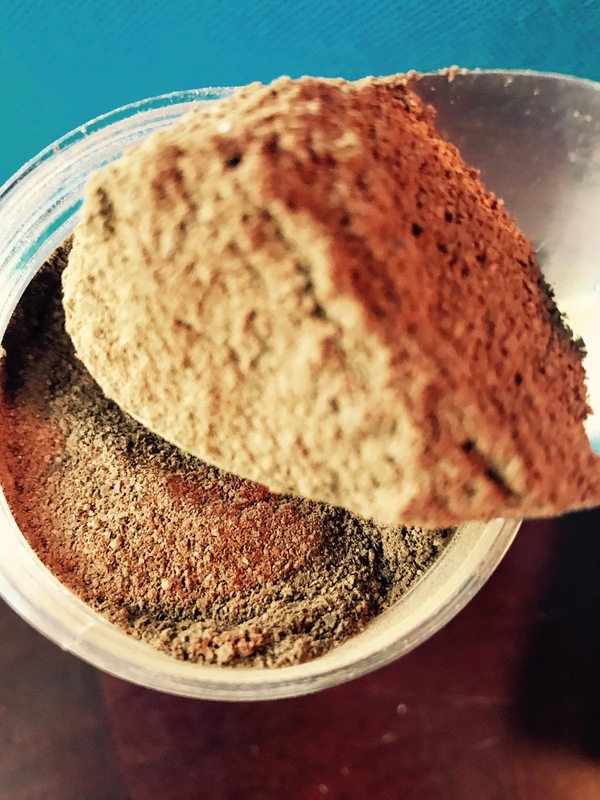 Today, we are going to look at two super fun recipes using this awesome new cocoa stuff, one being a cool summer cocktail. I was initially planning on posting two alcoholic drink recipes, but since not everyone drinks alcohol and a portion of my readers are under the age of 21, I wanted the post to be fair and have one boozy drink and one non-alcoholic kind. Of course the cocktail can be made non-alcoholic by using another type of liquid, like coconut milk or maybe even coconut water instead. These are both really fun drinks and seriously so yummy! Get creative and don't forget to keep sharing pictures of your Postum creations with us on social media! Prepare Postum by mixing it with boiling water and set aside to cool. Once cooled, fill a tall glass with ice cream scoops, strawberries, then fill with prepared Postum. Top with whipped cream and an additional strawberry for garnish, if desired. Enjoy! 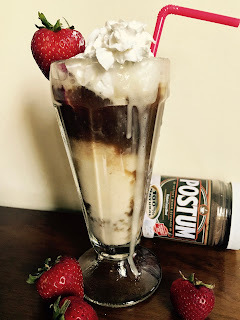 Every Postum recipe I make I really do say that it is my favorite one, but this has got to be my favorite one! HA HA! They are all so good, but I drank this down the fastest of them all! Just so absolutely tasty! The flavors melded so well together and it really does taste like neopolitan ice cream! Prepare Postum by mixing it with boiling water and set aside to cool. Fill a cocktail shaker about 2/3 up with ice and add rum and liquer to the shaker. Then add cooled prepared Postum and coffee creamer (a splash or to taste) to the shaker (you can even add the creamer in afterwards and just float it in the glass, like I did in the photo - which I think looks more beautiful! ); shake it up! Then fill a tall glass with ice and pour shaker contents into it. 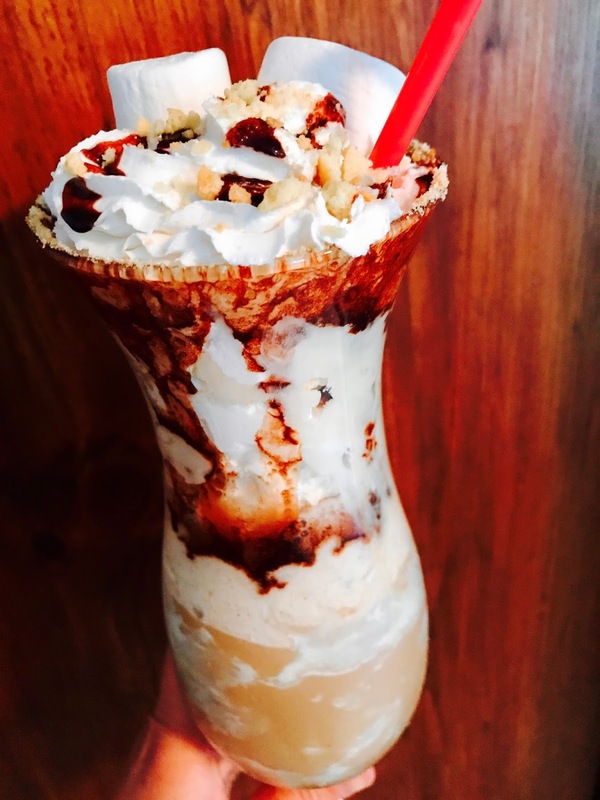 This drink can be topped with whipped cream, if desired. Please, as always, drink responsibly! This one was really interesting to make and I loved the way it turned out! 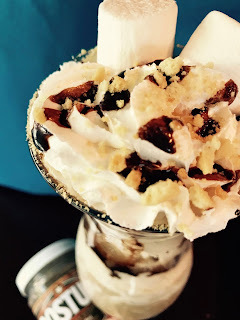 It tastes just like drinking one of those classic candies that has coconut, almond, and coated in chocolate - and the drink is just as decadent as I remember the confection being! I hope you enjoyed this one! I always have a good time creating and I truly love what I do, but this one was big fun for sure! Please stay tuned for more recipes using Postum; the next one is totally unexpected and will be awesome, so get excited for it! And for now, the Dirty Vegan is signing off - hope your day is soda fountain and candy shop sweet! Introducing Postum Cocoa & Recipe! When I found out about Postum's new addition to their product line, Cocoa Blend, I could hardly contain my excitement on wanting to review it! And then my mind started racing with recipe ideas. My mind is already filled with so many Postum recipe ideas that I have yet to create and share, but now with adding Cocoa to the mix, I never want to leave my kitchen. This post is a review of the new product and a very exciting recipe at the end! 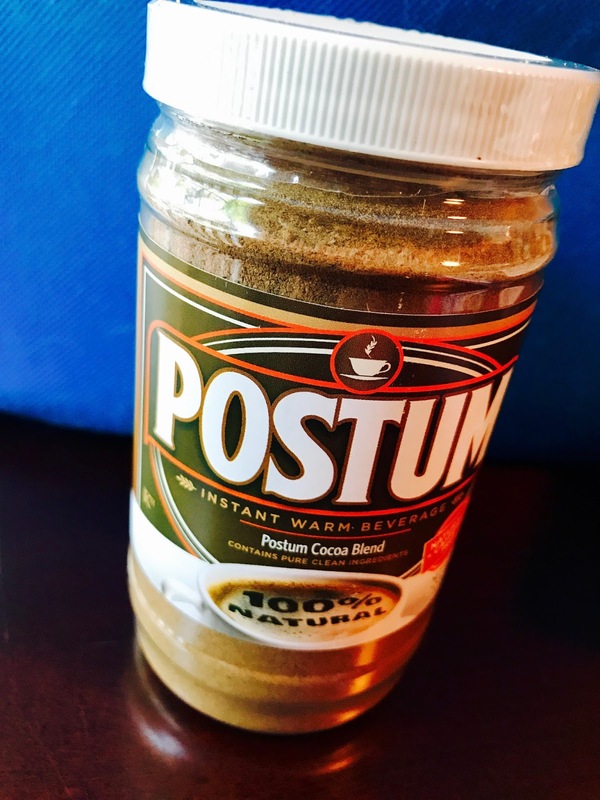 If you aren't familiar with the Postum brand, please check out my other Postum posts - they are an all-natural, vegan, kosher, non-GMO brand that specializes in an instant warm beverage in original, coffee and now cocoa flavor; a caffeine-free alternative to drinking coffee or tea, or a wonderful beverage to add to your life in addition to the other drinks. I felt like a kid on Christmas getting this package! I couldn't wait to open the jar and smell it! Yummm...smells just like hot cocoa mixed in with that familiar and comforting aroma of Postum. 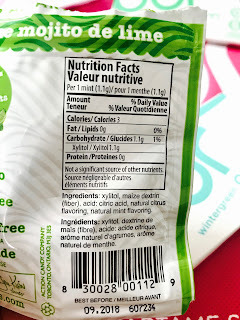 I noticed that it is still only 10 calories, no sugar and same carbs, just 2. I prepared a cup as usual. I usually take my cup of warm Postum by mixing 2 teaspoons of the product with 6 ounces of boiling water, Sometimes I add soy creamer or vegan milk, sometimes I drink it black. My initial reaction upon tasting it, was that it wasn't sweet like hot cocoa, but has that nice and subtle chocolate flavor intertwined with the flavor of Postum; it is simply delightful. It is also so very accommodating to customization since you can add sweetener or creamer/ milk of choice, that really brings out the cocoa flavor. 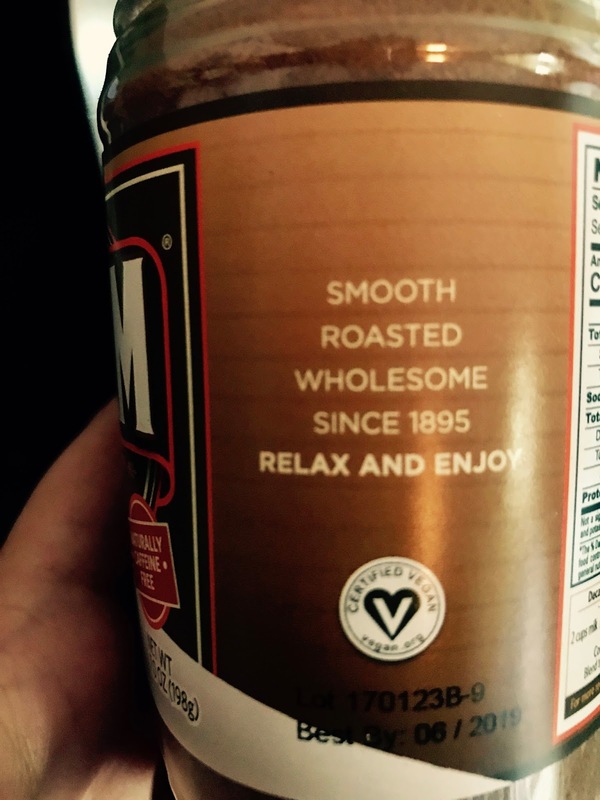 I personally liked enjoying it both ways - plain and sweetened with creamer. 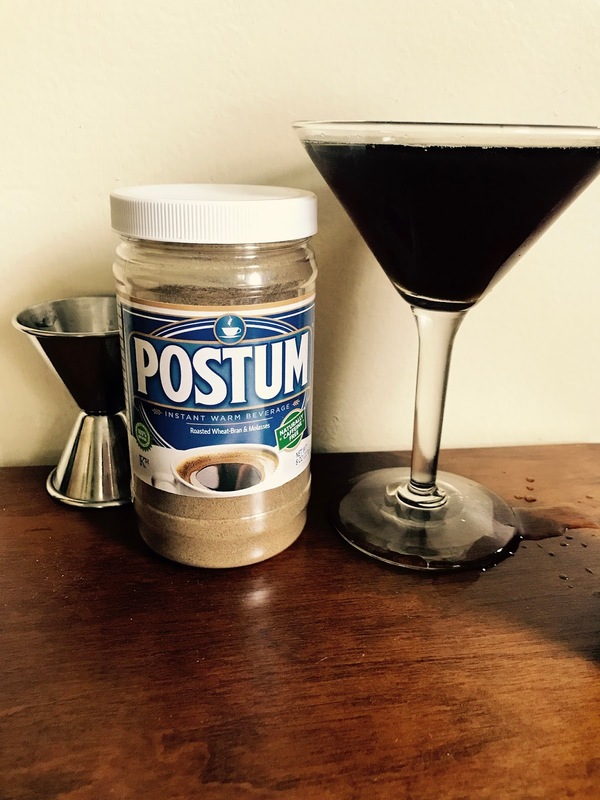 Just like the other Postum products, very versatile in terms of beverage as well as recipes you can do with it. I can also see this flavor being amazing made with steamed milk, or prepared then cooled to enjoy cold, and of course in so many fun drink recipes. Let's take a look at the recipe I created - like a frozen s'more in a cup! 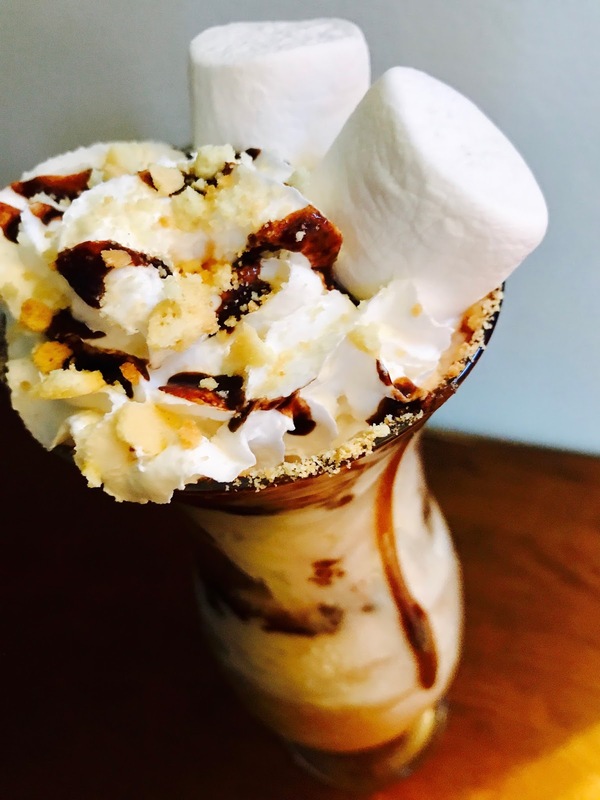 Optional toppings: vegan whipped cream, chocolate syrup for drizzling or for rim, crushed graham crackers to garnish or for rim, marshmallows for garnish. In a mug designed for hot beverages, mix Postum with boiling water until well combined. Sweeten to taste if using sweetener and add creamer to taste. Let the beverage cool. In a blender, blend prepared Postum drink, ice and graham cracker; set aside. In a microwave safe dish or cup, place marshmallow and creamer then microwave in 15 second increments, stirring when needed, until marshmallow is a liquid sauce. Drizzle marshmallow sauce in the inside of a glass or tumbler cup designed for cold beverages, then pour in your icy Postum from the blender. Top with toppings, if desired. You can find Postum on social: twitter, instagram, facebook! Tomorrow will be Postum cocktails!!! You won't believe what I came up with either. And for now, the Dirty Vegan is signing off - have a sweet day! 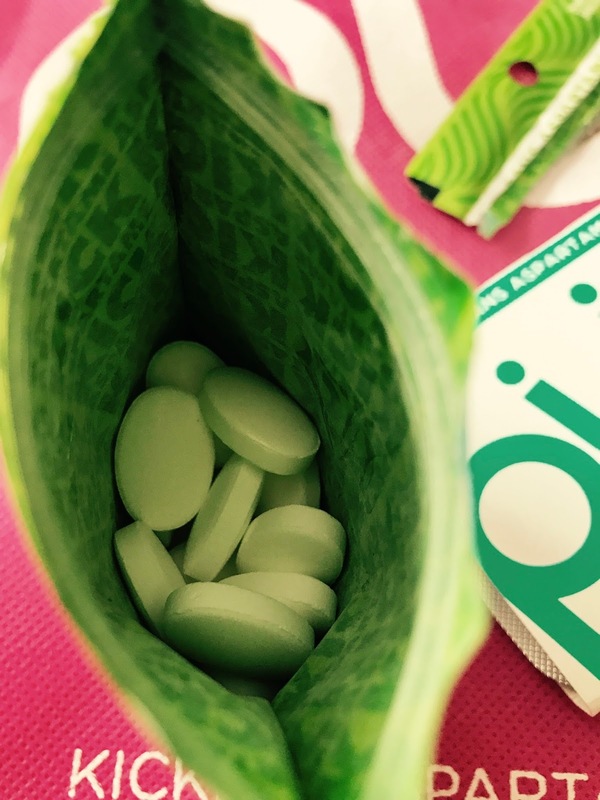 Real Chewing Gum for Vegans! No joke, I've had this fear lately that during book signings I'll be meeting people and I'll have coffee breath or something. I actually have been worried about it for a while now. You see, us vegans don't encounter a whole lot of chewing gums or breath mints that are vegan-friendly and not terrible for you at the same time. Then, like a mini miracle, the PUR company sent me a goodie bag and now I have no worries about the book signings, meet and greets, events, or about coffee breath in general. My past experiences with vegan chewing gum have been this: they are too chewy but then fall apart as you are chewing them and don't actually freshen your breath at all. It's a waste of time and calories and money. 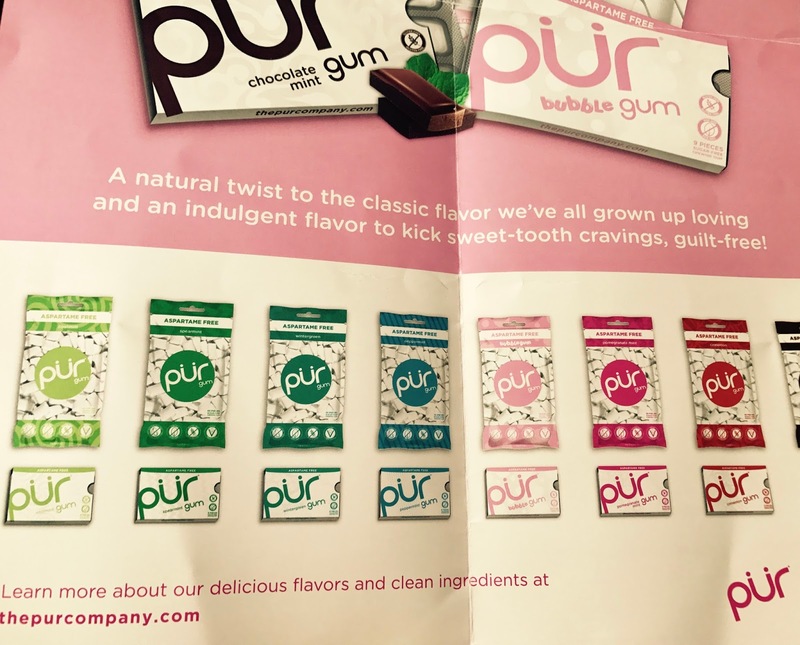 But with PUR, it is real and actual chewing gum. 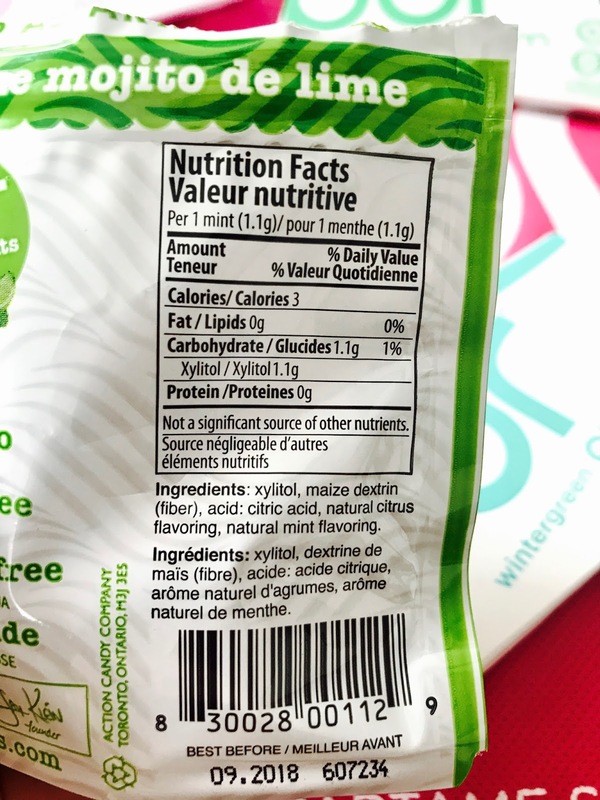 Exactly like the unhealthy ones that I remember, but these are vegan, sugar-free, gluten-free, contain xylitol, are free of nuts or peanuts, use natural flavors, are non-GMO and a cool bonus, they are Swiss made. 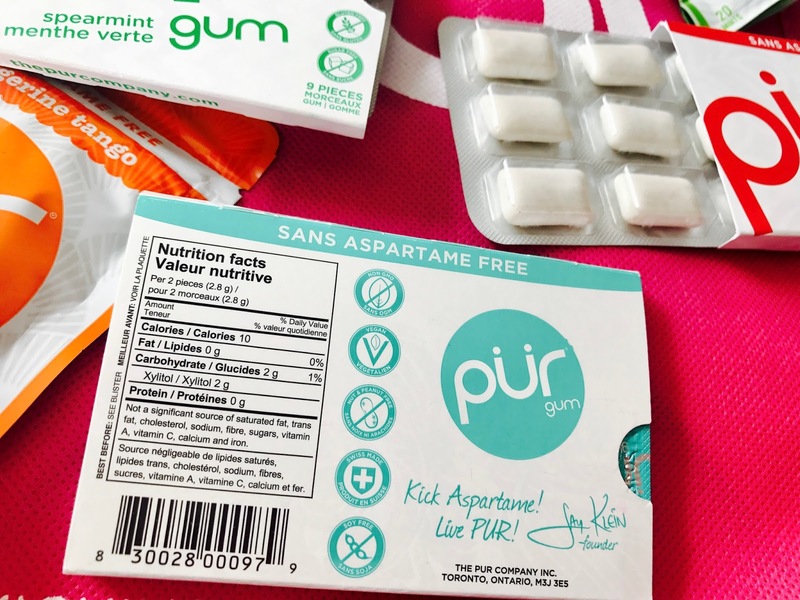 This gum kicks aspartame in the pants! 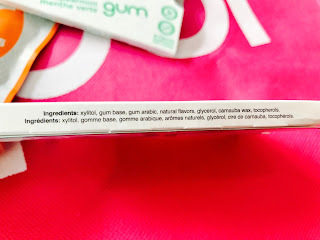 What I tried in my goodie bag were all of their flavors of gum and also two breath mint flavors! This was super fun testing the different flavors and experiencing a really awesome breath mint for the first time in a long time. I was thrilled by this whole goodie bag because I am a little self conscious about breath (I mean who isn't? Especially someone like me who loves her garlic!) and I can foresee that being a possible concern for me during book signing events. 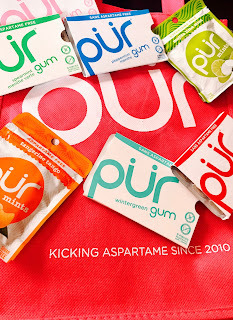 Let's take a look at the PUR products, shall we? Amazing gum flavors like: cinnamon, peppermint, bubble gum, spearmint, wintergreen and more! 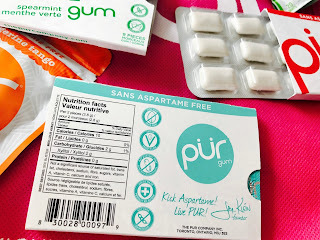 I noticed that the wintergreen and spearmint tasted just like this gum I used to love back in high school, a popular brand that still exists today (I'm not that old), but that is loaded with bad stuff you really shouldn't ingest. I also noticed that the bubble gum flavor is perfect! I really enjoyed every single one. 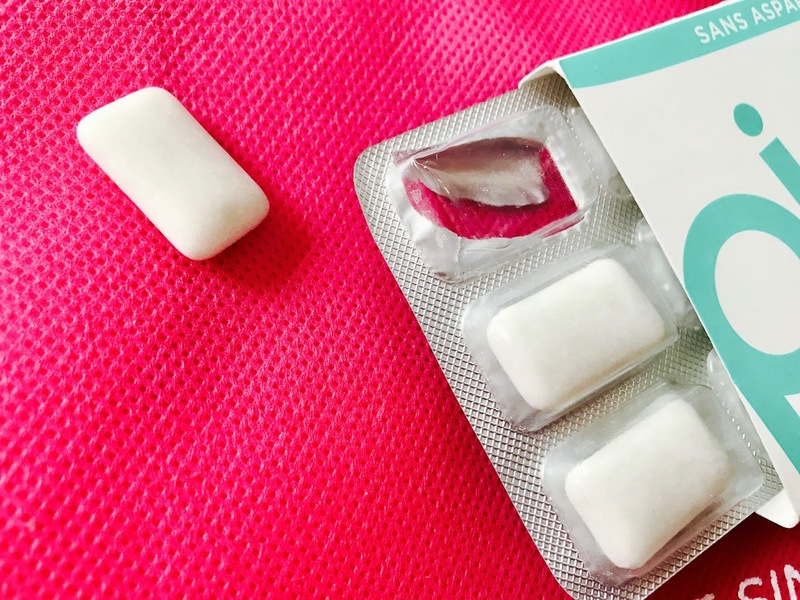 They come in a pack that keeps them fresh and are easy to carry around in your purse, bag or pocket - they are individually sealed in each foil rectangle (9 pieces per pack) and the gum doesn't come out until you are ready to use it, then you just pop it through. I didn't have a problem with any of these ingredients, especially considering what is in other gums. I absolutely love the mints too! They come in flavors: tangerine tango and mojito lime mint - both are refreshing and tasty! The gum and the mints both freshened my breath and I was really pleased. 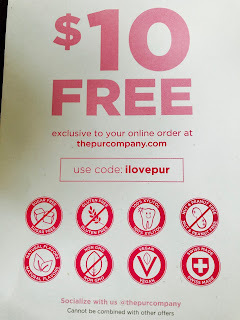 You can connect with PUR on social, they are @thepurcompany. 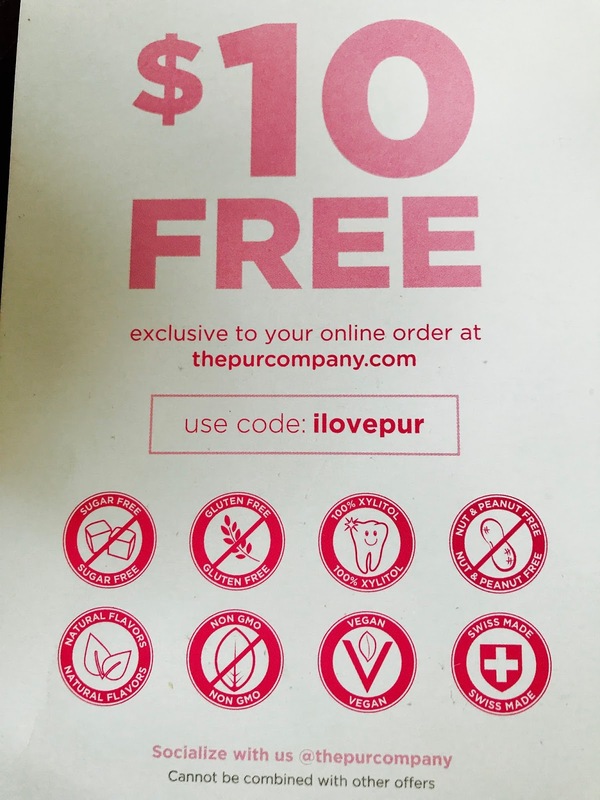 Also, if you want to order some of this gum to try, visit thepurcompany.com; if you use the code ilovepur you get a $10 discount! 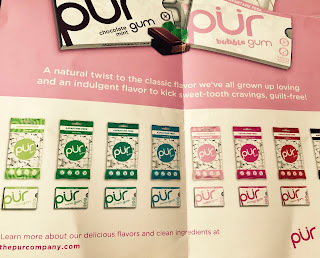 And huge shout out to PUR for sending me your awesome products to try! And for now, the Dirty Vegan is signing off - stay fresh.